Those who wait on their God, don’t know when He may part the waters so that His people can cross to the other side of the sea. Well, for digital marketers, Google is a lot like “waiting for God continually”. The Google god, that is. Now, about the Google god…the bad news first: no matter what method you use to get ranked faster in the Google index, there is no sure way anything’s going to speed things up. 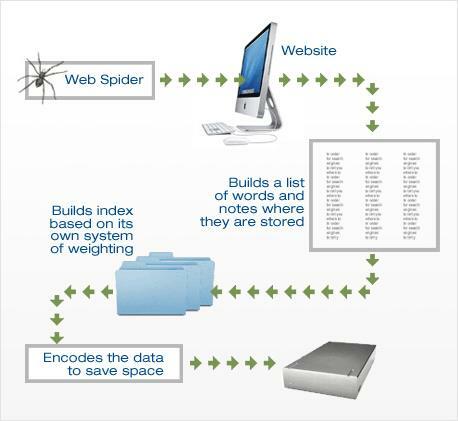 Crawling and indexing are processes which can take some time and which rely on many factors. In general, we cannot make predictions or guarantees about when or if your URLs will be crawled or indexed. Now that we’ve got that out the way, the good news is that there are many case studies which show that using one of the following methods has sped up the ranking process for many, so it’s worth a shot trying your hand at them. No harm, no foul. And just so you know…none of the following methods will bring the wrath of god on your site, unlike many of the paid-for scams that try to sucker you. And consequently result in your site being penalized, or in the worst case scenario, de-indexed like iAcquire was in 2012. Before we get to the meat (or manna) of the post, it’s important to understand the language of search engines so that you make the best decision about which Google index method to try. When spiders “crawl” to locate new content. When content is indexed, which is when it gets analyzed and stored. When an Internet user performs a search query and the search engine fetches relevant pages based on it’s previous analysis of the content. This is why so many of the methods I’m listing here (but not all), help build links from authority websites to yours. Forget spammy link building tactics. Long-term, they can do far more harm than good. But developing a link strategy that sends links to your website from other reputable, authority sites is a known method of getting ranked faster in the Google index. This works because when Google’s “spider” starts roaming looking for new content, it starts from the websites Google most cares about. Then it progresses through every link, page to page, through billions of pages. So if it finds a link to your content from a big website, it discovers your content faster than if there was no link to your website. Submitting guest posts to authority websites. Sending traffic to your site through links to content via social media. If you add a link to your site from a comment, Google and other search engines pick it up. It also helps them index your content better, because of your association to the website through your link. If your comment adds value, it may provoke someone to click to your site for more information. Making value-add comments can build relationships with bloggers, and may open doors to guest post submission and other positive influences. Compile a list of websites in your niche that allow comments on blog posts. You may want to set up a system through Google Alerts that sends notifications to your inbox when a new blog post is published on selected websites in your niche. Think of ways to make your comments add value either to the blogger, or to their readers. Avoid going wild by commenting on tons of blog posts because this could raise a red flag to the Google god. You submit content to a respected website. You write quality content that is valuable to the respected website’s target audience. If you don’t, the website is likely to reject your post. You don’t blatantly promote your own links. The respected website allows you to link back to your content. If they don’t, what’s the point of submission? Find websites that are respected and in your niche. Make sure the websites you want to write for accept guest posts. Find their guidelines and whether they allow natural inclusion of a link to other sites. Write for the other website’s target audience. Include a link to a relevant post already published on the quality site in your new post. If you are not a quality writer, you better hire one to write for you. Websites of authority don’t accept poor – or even mediocre – writing. That’s great news and the reason why the majority of online marketers use social media to promote content. Distribute the content linking to your website, through social media channels where your target audience is already active. The only way to build more natural, organic traffic is through regularly uploading fresh content to your website, through a blog or adding an extra page, or even updating the content you already have on your site. If you don’t add regular, original content, the alternative method to build traffic is to pay for it. But once the money dries up, so does the traffic. So it’s a given that online marketers upload regular, fresh content. The more content you add to your website, the more traffic you’ll get, and the faster the content will be added to the Google index, says Neil Patel, a World Renowned Digital Marketer. This method requires patience and perseverance, though, because you won’t see instant results. Blogging works for every kind of business, industry, or niche, as well as for almost all business models — even B2C and e-commerce sites. Some industries just require a bit more creative juice than others. If you haven’t already, research your target audience persona so that you can come up with topics that attract the right people. Use a free tool like UpCloseAndPersona to get started. Find the right keywords to use in your content, so search engines understand what user searches will be relevant to your website. Write the content or hire a writer to do it for you and upload it to your blog. Use one of the methods listed here to rank the page faster in the Google index. Surprisingly, not many bloggers use the Fetch as Google tool, but Search Engine Watch claims that Google will crawl the submitted URL normally within a day, and sometimes in less than 5 minutes. Having said that, it’s fine to be optimistic, but don’t count on it! Login or set up a new Google Webmaster Tools account. Once you’ve set it all up, select the domain with the content you want added to the Google index. Now enter the URL of the page, and click “Fetch”. If all goes well, click “submit to index”. There are no guarantees that any of these methods will get content ranked faster, but they may. Don’t be tempted to fall for link building schemes where you have to pay as these can do more harm to your site than good. Understand how search engines work so that you can choose the best way to rank faster on the Google index. Develop an offsite link strategy by commenting on other blogs, submitting guest posts to authority websites, and using social media to link to your content. Use the “Fetch as Google” tool. This article is really impressive as it shows some successive methods to get content ranked swiftly. From all of your points to get content ranked swiftly. I find four point is valuable that are. 1. Submitting guest posts to authority websites. 2. Sending traffic to your site through links to content via social media. 3. Regular publishing of fresh content. 4. The most important one is quality content. So thanks for sharing such a awesome article. Hi Dana,I found your post very interesting and useful for everyone, I really like this post. Back links from High page rank sites are beneficial for search engine ranking and indexing. The post was informative that updated my knowledgebase. I also checked a few posts of your blog and I am impressed with your writing style. I will subscribe to your blog. You have crafted a very good. And I will surely be keeping in the mind the points you have shared. Am an astrologer by profession, I was working under someone for training purpose from quite a few years, but now i have opened my own office, to make it popular am doing every possible thing. I have hired a person to do door to door marketing for me, am offering incentives to him for every client case that he brings to me, for online marketing i have hired a person too, i have an astrology website too, so that i offer my services online, but still somehow am not able to explore my website or my name more. It is also a kind of business for people like us, where we also need some investment before starting it. Getting a site to show up in search has gotten more challenging over time. You almost have to get coverage on other sites to make that happen. That is why most people end up advertising using AdWords or Facebook ads or something similar, instead. Thanks for the info Dana. I have known and use blog commenting, sharing to social media, and posting regularly. I did not know about using the Fetch as Google tool. I may have to try that out. Excellent article, thank you for sharing such an informative article about indexing content in google SERP. Aat present initially google prefers the content when it consider for the ranking. we really need to know about optimization techniques for the content. Thanks for your valuable Article sharing. I collected some points to get content ranking for my websites. Really, there have some miserable points like blog comments, guest post, URL fetch by Google etc. for getting more traffic. Great post! I am trying to do everything I can to apply this to my industry. I am a mortgage broker in the US and I have noticed that very few to almost no company is doing any SEO or digital marketing. Thanks for providing great method to get ranked on search engines.I will use your method to get my blog ranked high. The reason it works well on CommentLuv blogs is that it is a community where we all know each other. You are correct that by default comment links are nofollow. Because i run the CommentLuv Premium plugin, I can make either link dofollow and years ago I had both of them dofollow. But now I feel that having them dofollow might cause commenters to be penalized. They are both nofollow now, but I’ve considered making the CommentLuv link dofollow again. Well i totally agree with you that if some one really want to rank their content and want that Google index their content instantly, then they must follow all the above mentioned points which help them to grow their blogs and which are indeed beneficial for the betterment of their blogs. Because without working on above mentioned guidelines they didn’t get any satisfactory results. Some great tips here. I recently started a new blog (about 3 weeks ago), so this info is helpful. I forgot about the “fetch as google” and will need to try that on some recent articles. Thanks again. I noticed that you have pointed some useful topic in your post .Personally i like this . We can rank our content if we follow this topic . Thanks for a good writing . Really this post is very helpful for me and i learnt how can our site improved. thank you for sharing this aticle. Hello Dana, some very useful tips, you explained the points very well. Many bloggers usually are unaware of the power of commenting on blogs, but it is one of the very effective ways to for link building. For guest posting,outreaching to fellow blogger is very important, I myself do guest posting and according to my experience on an average, out of 100 emails you send, 9/10 blogger will reply to you mail and for this also you have to outreach them a couple of time but this work pays off. I was aware of submitting a site to Google as you have mentioned but never tried it. i will surely try hands on this one. Overall the content you shared is very knowledgeable and I appreciate you shared this valuable information with us. I have personally seen a 100% increase in traffic to this blog just from commenting on other CommentLuv enabled blogs. Guest posting is better for SEO value, but commenting can be better for traffic generation. I’m surprised you manage to get a 90% response rate to emails. Many never get through or land in spam. It was really a informative post, the strategies mentioned are really worth to get a nice traffic to our blog, it really helps a lot by reading these type of articles, thank you for posting this article. Something everyone seems to miss is if its a blog put the meta tag from Google plus on the blog showing the business as a publisher then your personal account as the author… its really easy to do and worth buckets. It also means your g+ pic will show up alongside your content in search. I am trying my best to get indexed on google on top pages. I’ll try these methods too. But as per my knowledge using fetch by google option is limited for some posts, isn’t it? Great tips Dana! The methods you mentioned in this post are really effective and will surely help websites get the top rank on search engine results.